I used to get a lot of migraines and fortunately do not anymore, however I had a nagging headache all day yesterday which developed into a full blown migraine in the wee hours of this morning. I had so much that I wanted to accomplish today, i.e. finish two kindreds to put up in my shop, and instead spent most of the day in bed. Oh and it snowed slush all day today. Last week was t-shirt weather, followed by a rainy weekend, capped off with wet, wet snow today. I don't know why I kept thinking today was Tuesday, because it was SO definitely a Monday. This was taken a short time ago, and it is not a black and white picture. Mother Nature's idea of a joke. I am sorry you weren't feeling well, Sue! Maybe it IS a good time to just hang out. The weather is strange all over--I think this has been the longest "winter" I can remember! I am so sorry Sue you had a bad day and a worse night! Bless you and get well soon! I know tomorrow will be a better day! The snow is pretty but I am tired of the cold and ready for a little bit of warmer weather. Tonight it's supposed to get down in to freezing and two days ago I had on shorts! But not to worry.... rain, wind and cold dreary temperatures on Wed.
Do you ever put a cold wash rag on your eyes when you get a migraine? That for some reason always helps me. 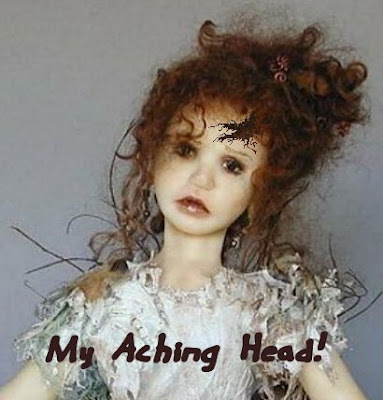 This little lady really looks as though she has one of those awful headaches! I hope that your experiences with migraines are over! Perhaps the weather has something to do with it. The roar from the lake here sounds like November, not April! Sue, get yourself some Lavendar..it will help with those headaches! Trust me! LOL I hope you feel better soon! As for the crazy weather...I think Mother Nature is very upset and confused here lately! We are getting a storm tonight into tomorrow...eeekkkk and I was running around with shorts and tank top 3 days ago...now what the heck is up with that? LOL Get some tea, rest and can't wait to see what you got cooking! Cheers my friend! I hope you feel better soon! I used to get migraines all the time when I was working in an office (being inundated with smells that set off my allergies). Now that I'm home all the time I rarely get one, and it's sooooo nice to be without them. As for the snow, it seems that Mother Nature is extremely confused of late. We had snow yesterday - not enough to stick, though. Feel better Sue. Maybe the wicked weather is having a part in the headaches? We had snow overnight and now tonight a flood watch! Crazy! Ahh, I know the feeling of not wanting to do much work and just sit and do something easy on the brain! Hope you feel better soon! I get regular migraines and there is not much I can do - except rest for 3 days, which usually frustrates me because I want to bead and stitch and create! Ah Sue...I'm so sorry you have to deal with migraines. They're just so nasty! Hope you're up and about and feeling better soon! migraine (or migraine hangover). Yaaaayyy! 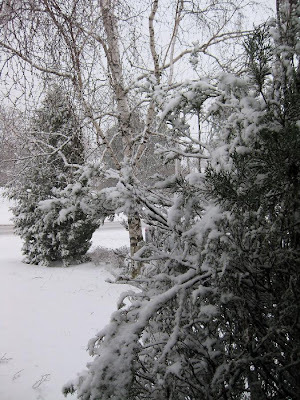 As for the snow, it continued all night and we now have over 8 inches (17cm) of the white stuff. If this was December, I would be thrilled - April? not so much. Oh boy can I relate to that. Where your old headaches from Pre-menopause? I have been getting them for years now. I cannot wait till I am 50! lmao. Just joking, I can wait 10 years, but I am looking forward to NO MORE headaches! I too suffer from Migraines and hope you feel better soon!!!! I am sooooooo glad you are better! Can't wait to hear how the "creeping" turned out...lol. ... aha! I finally got it ... Batina's sweet face (which I am trying REALLY hard to talk uber-spouse into getting me for my birthday) has reminded me of someone since I first saw her ... and I just now got it ... she reminds me of the little girl that sings "Blue Christmas" in "The Year Without Santa Clause" - do you remember that Christmas special? I am glad you are feeling better and I hope that weather changes soon! You guys are SO sweet, and I'm sorry to hear that some of you also suffer from migraines. Jenny, yes, mine are hormonal. Michelle, will have to google that movie. I remember seeing it, but do not remember the little girl singing. Well, our weather today is sunny and it is warming up abit. Hopefully by the weekend most of the 8+ inches of snow we got will be gone. Wishing you all a happy and creative day! Sorry about your headache Sue! I know how frustrating it is to make plans and then watch the day disappear with nothing done. Thanks for visiting my blog too. I am always thrilled when an artist such as yourself leaves me a compliment! Hope your feeling better and get lots done. Condolences on the weather, I live in the same kind of country. Sigh...Spring is just a far off hope.